This was the third catalogue of the books belonging to the Literary and Scientific Institution, which the public could subscribe to use. The first catalogue of the Literary and Scientific Institute was made by Mr. Hart in 1843, but no version survives. 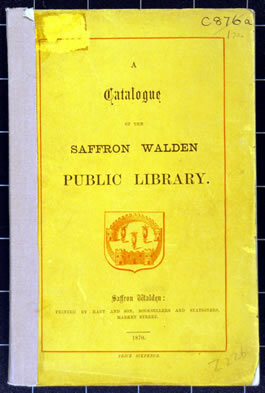 The second catalogue, which dates from 1852 lists several hundred works under ten classes, including eighty-five works of fiction. This 1870 catalogue was drawn up after the library had been enlarged in 1867 by the addition of the libraries of the Horticultural and Agricultural Societies. The public library it refers to is actually what we think of as the library of the Literary and Scientific Institute - there was no County Library as yet.